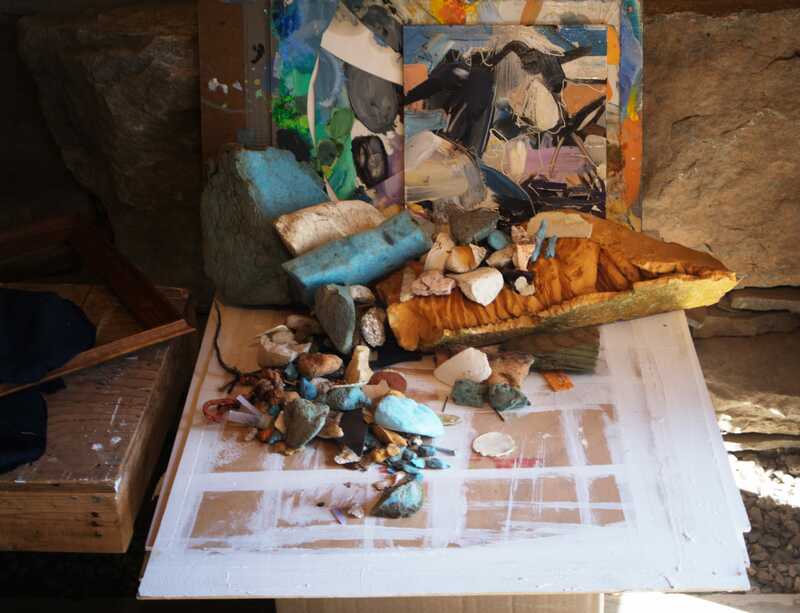 Applications for the 2018 artist residencies at the Joseph A. Fiore Art Center are open! 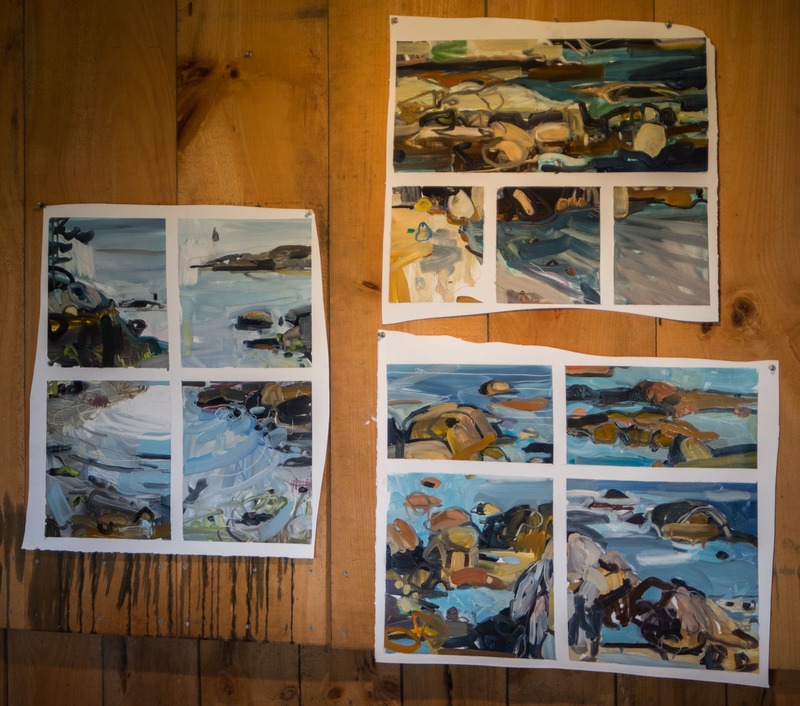 There will be six visual art residencies (5 for Maine artists, 1 of which is reserved for an indigenous Maine artist; 1 for an out-of-state or international artist), one performing arts residency, and one writing residency. There will also be a seasonal position for a resident gardener with affinity for the arts. Apply here. 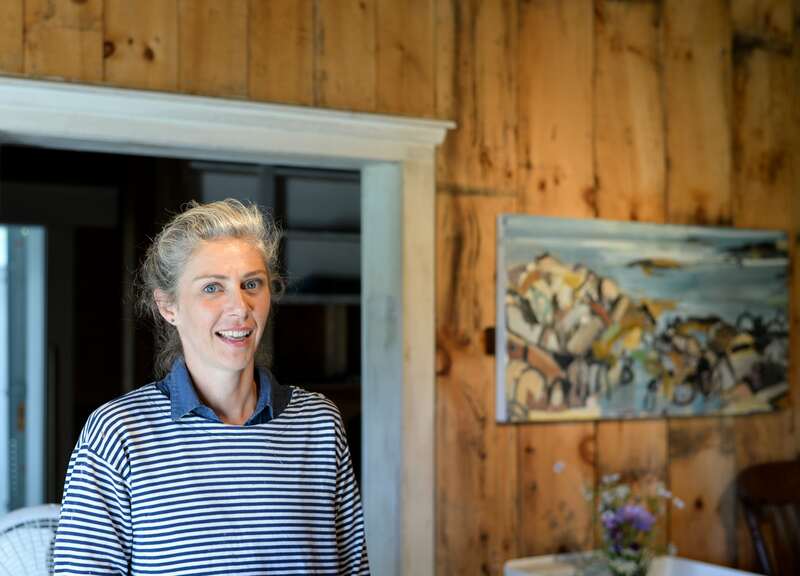 FMI or contact Denise DeSpirito, Fiore Arts Center assistant: denise@mainefarmlandtrust.org. Hoy didn’t come to Jefferson planning to follow in Carson’s footsteps. 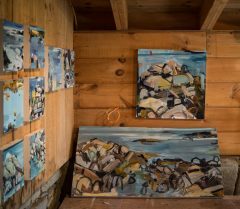 For the past year and a half, she has been painting Superfund sites: locales that the Environmental Protection Agency (EPA) has determined to be among our country’s most contaminated, and in grave need of national aid and intervention. (The EPA was founded in 1970, in response to the environmental fervor generated by Carson’s work.) However, upon arriving in Maine, Hoy started to revisit Carson’s writing. 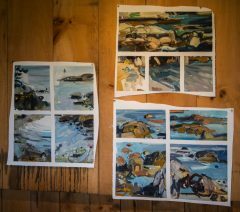 Learning of their proximity, she then began to visit and paint the same shorelines that had inspired Carson’s early research. Despite fifty years of distance, these zones remain largely unchanged. 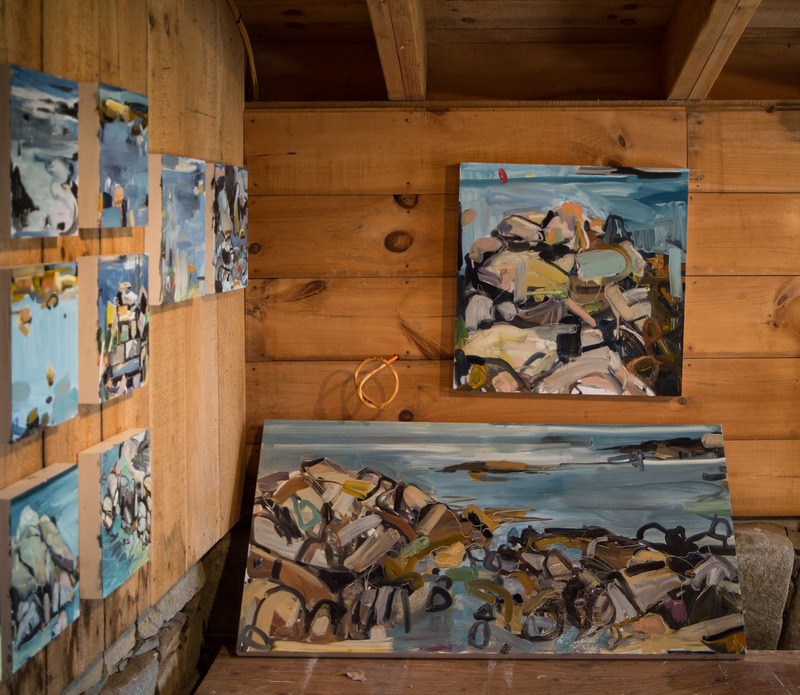 True to Carson’s tradition, Hoy does most of her work outside, painting with oil and drawing with whatever materials might be at hand: pastel, watercolor or pen. “My paintings and drawings are pretty fast,” she confessed. “I feel like the further away I am from my experience, the more it can start to become something else.” More curated are Hoy’s sculptures, which mimic her paintings in both subject and form. “They’re on the wall and have a framing device,” she explained. “They’re almost like a little diorama or a stage set.” The sculptures are made out of found materials: scraps of fabric purchased at local church sales, carefully selected pieces of beach trash and more. “What happens,” Hoy explained, “is really terrible but also sort of cool. Little bits of plastic get tossed with the rocks and end up looking like rocks themselves. 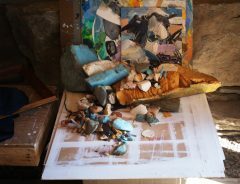 Even Styrofoam cups look like pieces of shell or something.” She retrieved a fistful of synthetic treasures from the other side of the studio and arranged them delicately on the ground between us: an impossibly round sand dollar, a smooth stone, a necklace-grade piece of shell. “They’re really hard to find because they blend in so well,” she said. The Superfund site nearest to Hoy’s home is Newtown Creek, a tributary of New York City’s East River that separates Brooklyn from Queens. Despite its designation, the area remains industrial. The riverscape features a recycling plant, petroleum trucks, barges that carry crushed cars and a colony of stray cats. No signs name the creek’s status as protected; Superfund sites are unmarked. Online there is a database that lists site names, but it lacks full street addresses. Hoy uses satellite images on Google Earth to locate sites she hasn’t yet visited, looking for large, empty pieces of land.